I swear that the month of May is busier than any other month at our house! And there are so many great deals out there, too! 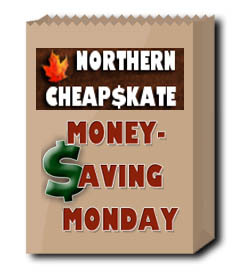 Score some savings with this week’s edition of Money-Saving Monday! Get a free sample of Fixodent on Facebook. Get a free sample of U by Kotex. Get a free sample of MiO Fit water enhancer. Get a free sample of Gevalia House Blend coffee. Sam’s Club members can get a free sample of Glad ForceFlex OdorShield trash bags. Download a free copy of Deep-Fried Goodness by Hoppin’ John Martin Taylor. Get 5 bonus Box Tops for your school. Save $.75/1 Dole Fruit Smoothie Shakers. Save $1/1 Mott’s For Tots Juice. Save $1.50/1 bag of Seattle’s Best Coffee. Save $1.50/1 Starbucks K-Cup pack. Save $2/1 DiGiorno Pizzeria! Pizza. Save $2/1 Fresh Results cat litter. Save $.55/1 Land O’Frost Bistro Favorites, Premium, DeliShaved, or Canadian Bacon. Save $1/1 Sunlight Dish Detergent. Save $1/1 Wisk Laundry Detergent (45 oz. / 24 Loads or Larger). Save $.75/1 Bar-S Beef Franks. Save $7/1 Zyrtec product 24 count or larger. Save $1/2 Cream of Wheat products, 9.8 oz or more. Save $1/1 Lance Xtra Fulls Sandwich Cracker 8-pack. Save $.75/1 Kikkoman Teriyaki Sauce. Save $2.50 when you buy both a Neutrogena Cleanser & Moisturizer. Save $1.35/4 Gerber Graduates Snacks. Save $2.55/2 Brew Over Ice K-Cup packs. Save $1.10/1 Hawaiian Punch Aloha Morning 10oz 6-pack or Gallon sizes. Save $.80/1 Mean Green SuperStrength Cleaner & Degreaser 32oz. or larger only. P&G. Get a $10 prepaid card by mail when you buy $30 worth of participating P&G products at select retailers before 6/30/13. Kellogg’s. Collect codes from inside specially marked packages of Kellogg’s cereals and get free movie tickets, Monster University music downloads, or a Monsters University pillow case. Offer ends 12/31/13. Fekkai. Get a $20 prepaid card by mail when you buy $50 worth of Fekkai products before 6/30/13. Find the rebate form in the 5/19/13 Smartsource insert. Finesse. Get up to $2 back by mail when you buy Finesse With a Touch of Yardley Lavender shampoo or conditioner before 9/30/13. Dr. Scholl’s. Get a free reward with the purchase of select Dr. Scholl’s inserts before 6/23/13. Rewards vary in value from $5 to $40 and include free amusement park passes, dance lessons and more. Jolly Time. Get a free one-year subscription to Weight Watchers magazine when you buy 4 boxes of Jolly Time Healthy Pop popcorn before 7/15/14. Jolly Time. Get a free collapsible water bottle by mail when you buy any 3 packages of Jolly Time Microwave Pop Corn. Offer good while supplies last. Scott. Get a free $4 Vudu movie credit when you buy a Scott Extra Soft Bath Tissue 24-pack double roll or Scott Towels 6-pack mega roll before 7/31/13. NeilMed. Get $10 back by mail when you buy a NeilMed NasaFlo Porcelain Neti Pot at your local CVS Pharmacy before 5/31/13. Get a Rubbermaid 12-Piece New Premier Food Storage Container Set for just $19.79 at Amazon for a limited time. We have this same set at our house and we use it all the time. Get a free personalized photo tote bag at York Photo. Just pay $3.99 shipping. New customers at Snapfish can get an 8×11 custom cover photo book for $10. Offer ends 5/31/13. Sonic is offering half-price shakes every day after 8 p.m. all summer long. Never pay full price for sneakers again! Shop the Daily Deal at Joe’s New Balance Outlet and get up to 70% off shoes and apparel. Target is having it’s biggest video game sale of the season. Get great deals on Nintendo 3DS, PS3 games and much more!